← Dr. Walter Kaiser on Can We Believe in Bible Miracles? (10) God’s Promise to Israel is certain as the existence and order of the universe! Jeremiah 31:35-37 sates, “Thus says the Lord, Who gives the sun for light by day and the fixed order of the moon and the stars for light by night, Who stirs up the sea so that its waves roar; The Lord of hosts is His name: “If this fixed order departs from Me,” declares the Lord, “then the offspring of Israel also shall cease from being a nation before Me forever.” Thus says the Lord, “If the heavens above can be measured, and the foundations of the earth searched out below, then I will also cast off all the offspring of Israel for all that they have done,” declares the Lord. For all twelve of these facts Hocking provides many more Scriptures with insightful commentary. 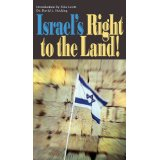 The reality is that the Bible is full of passages, plans, and promises for and about Israel and her right to the Land. Hocking’s study is very compelling because of the plethora of biblical evidence in support of God’s plans and promises for Israel and her land.